Registration is closed. No onsite registrations will be accepted. List any problems and strengths of research used to support current topics in association with dry needling, regenerative medicine, chronic osteoarthritis, hip injuries. Develop effective methods and strategies of evaluation and treatment focused on dry needling, regenerative medicine, chronic osteoarthritis, hip injuries. Identify and discuss methods for minimizing issues related to event medical management for athletic trainers. Discuss the Indiana tissue donor program and how the IATA is partnering with the Indiana Donor Network. The IATA’s target audience for the Annual Meeting are Certified Athletic Trainers and other health care professionals that may find an interest in the content and knowledge the association and its constituents have to offer through lecture and laboratory presentations. 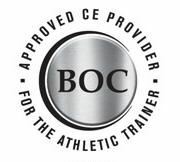 IATA is approved by the Board of Certification, Inc. to offer continuing education for Certified Athletic Trainers. **Educational Partnerships - Some educational programs have opted to subsidize student registration. Please check with your program prior to registering. Refunds, minus 25% of the registration fee, will be given only if requested two weeks prior to the event. Payment must be received three days prior to the event or the registration will be canceled. In the event the Annual Meeting is cancelled, a full refund will be given.